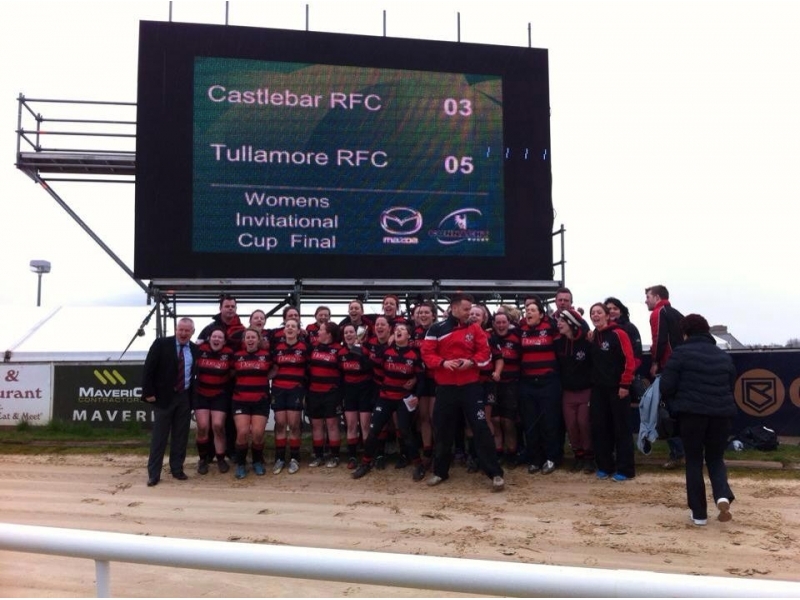 Tullamore Ladies Rugby celebrated their first season of rugby with a tremendous victory in the Connacht Invitational Cup final on Saturday. The Galway Sportsground was the venue as Tullamore edged out Castlebar on a tight score line of 5-3 which doesn’t give a true indication of the high standard of rugby on show. The home of Connacht Rugby provided a near perfect pitch for this final which allowed a high quality game of rugby as the rain held off. Tullamore showed no signs of nerves as they settled into the game early. Their excellent handling and rucking skills were to the fore as they made their way from their own 22 to the Castlebar try line with their very first possession. While a try was not forthcoming, it provided great hope for the half. As it transpired the Castlebar team showed the reason why they’re Connacht league champions and exerted an extended period of dominance. They mixed using runners off the out half with wider plays to stretch the Tullamore defence. This increased pressure led to a penalty chance in front of the posts which their out half converted. The intensity of the final was there for all to see and it was hardly surprising that the big hits going in from both sides produced some casualties. Castlebar’s Nicola Hall had to be taken off with a broken arm while Tullamore lost their main lineout threat Rose Dunne to a broken wrist. With the breeze picking up, the priority for Tullamore was to get through to half time only three points behind. As has been all season, the Tullamore defence held firm despite Castlebar’s best efforts. While the message at half time was to use the wind to push Castlebar back into their half, the Mayo outfit showed their skill and resilience to thwart Tullamore’s plan. Eventually, Tullamore were able to gain a foothold and used their kicking and resultant lineouts to advance up the pitch. The telling moment of the match came as a result of this pressure. Despite losing their own lineout, Tullamore’s full back Sarah Keating gathered the clearing kick before spreading it out to Jill Draper. Jill threw a beautiful pass out to the onrushing Ciara Dunican who made her way around the Castlebar defence to their 5 metre line. The forwards brought them even closer to the try line through a series of pick and drives before scrum half Ailsa Hughes sniped down the blindside and wrestled her way over the line. It was a real team score with vital contributions from a number of players. The conversion from the sideline was missed to leave the score at 5-3. The final 20 minutes of the match produced some very good rugby from both sides. Tullamore continued to use their wind advantage to push Castlebar back into their own half but were unable to capitalise on the scoreboard. Similarly, Castlebar continued their well structured game to fight the conditions and make their way into Tullamore territory. On one such occasion, they opted for a shot at goal from a penalty but the attempt fell short. As the match entered its closing moments, Tullamore looked in control as Castlebar had a lineout in their own 22. It is a credit to their ability that Castlebar went through a series of phases to push Tullamore back into their own 22. Tullamore’s defence and first-up tackling have been their greatest strengths all year and it was to the fore when it was needed as they thwarted the Castlebar advances. Eventually, this defensive pressure brought a misplaced pass that Danielle Martin kicked out of play. The final whistle was met with tears of joy from the Tullamore ladies as they celebrated a well deserved victory. The victory was a culmination of months of hard work and was a deserved outcome for a talented group of girls. 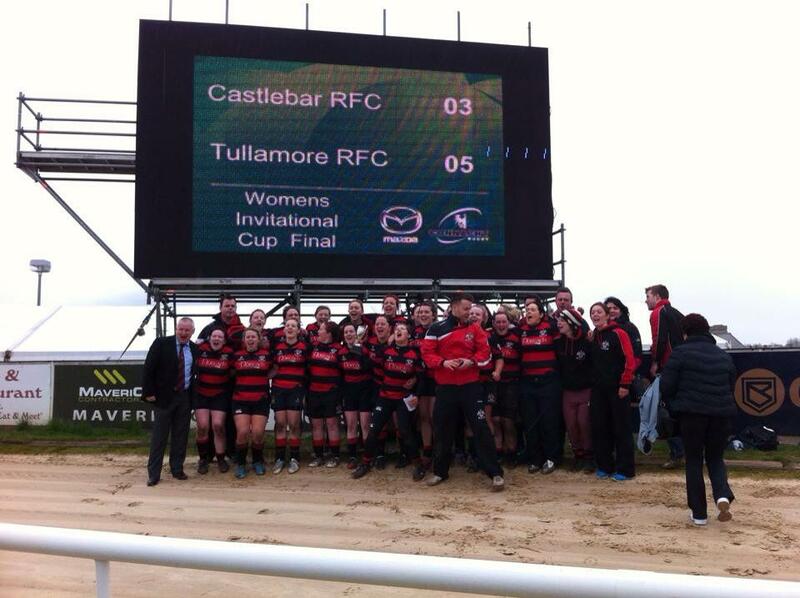 Tullamore would like to thank Castlebar for what was an excellent final. Without doubt, the game could have gone either way and it made victory sweeter that it was against such a high quality side. Stand out players were Tullamore’s Katie Byrne and Róisín Feighery and Castlebar’s Caroline Staunton and Emma Doyle. Tullamore would also like to thank Connacht Rugby for the chance to play in the Cup and the immaculate venue provided on Saturday. The players and coaches would like to extend their thanks to Susan Bagnall, Olive Tierney, Ray Dempsey and club president Gerry Egan for their role in this achievement. We would also wish speedy recoveries to Rose Dunne and Nicola Hall. Tullamore Squad: Evelyn Browne, Patrice Browne, Katie Byrne, Mary Kate Callanan, Vicky Cobbe, Jill Cobbe, Sarah Coffey, Clare Currams, Niamh Darcy, Jenifer Draper, Jill Draper, Ciara Dunican, Rose Dunne, Alma Egan, Tara Evans, Ciara Farrell, Róisín Feighery, Grace Flynn, Eimear Fox, Róisín Griffin, Ailsa Hughes, Brigid Hyland, Maeve Jaffray, Sarah Keating, Pauline Keating, Tamara Keegan, Róisín Keenahan, Cathy Kinnarney, Chloe Lowry, Danielle Martin, Sarah Jane McGuire, Ann Marie McKeon, Brenda O’ Connor, Tara Sexton and Jayne Smyth. We are always looking for new players and look forward to seeing new faces during the summers tag and 7s tournaments before embarking on the 2014/2015 season.